Always afternoon : intimate music for violin and piano / Jeremy Blackman, violin ; Pauline Pidgeon, piano. Evening under the hill : for violin and piano / Miriam Hyde. 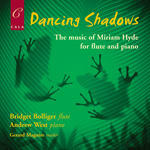 Dancing shadows : the music of Miriam Hyde for flute and piano / Bridget Bolliger flute, Andrew West piano, Gerard Maguire reader. 5 solos for flute and piano / Miriam Hyde. An anthology of chamber music / Miriam Hyde ; the Sydney Chamber players, featuring piano: James Muir. Kelso overture & works recorded at her 90th birthday concert / Miriam Hyde. Difficulty: Medium — AMEB grade 4. 3 Jun 36: Adelaide Town Hall. Featuring Arved Kurtz.